Here at Ready Decks, we are all about getting involved with the outdoors just about every chance we get. When we get a good and unique chance to associate our name with outdoor activities, we try to always take the chance. Recently we were presented with a very unique opportunity that we were never involved in, or have ever thought about. Ready Decks is proud to announce that it has recently sponsored the up and coming Professional Bass Angler Jessie James. Jessie James has been pursuing professional fishing tours since 2007 and continues to do so through 2011. Jessie is going to be fishing in a hand full of tournaments this fishing season with the hopes of stretching his efforts into the Bassmasters Classic. 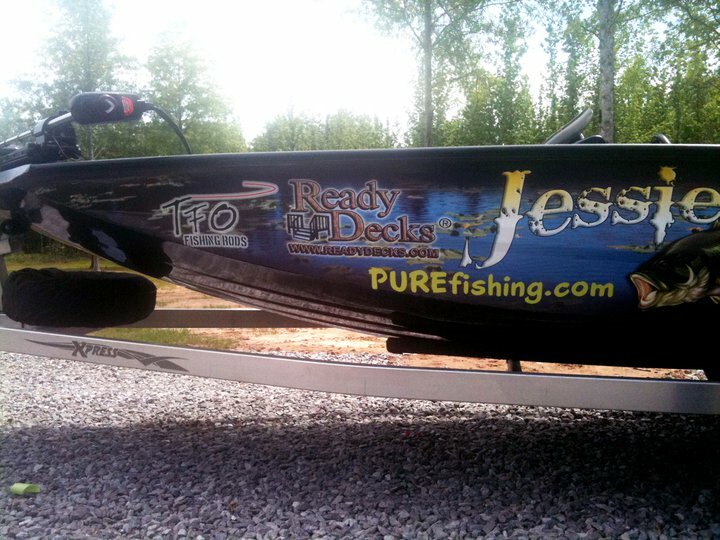 With the sponsorship of Jessie James, we were able to get our logo on his boat, as seen in the picture (click to make larger), which will appear in the 2011 “Fishers of Men” tournament as well as the 2011 “Bassmasters Outdoor Series”. We will be rooting Jessie on as he takes part in these tournaments. We wish Jessie James the best of luck as he fishes his way to a possible spot in the Bassmasters Classic, and hope to see the Ready Decks logo grace the television screen as one of his lucky sponsors.